Fraud is the crime that touches nearly everyone. Your only line of defense against fraud, identity theft and scams is information. This book provides that information and shows you how to take effective steps to protect yourself, your family and friends. It provides the information in a concise, easy-to-read format. It also provides a section on 'Golden Rules' to avoid most scams, as well as helpful tips and strategies. Keeping yourself and those you care about safe requires that you are proactive in the way you approach online banking and shopping, Web surfing, email management and just about everything else you do on the Internet. Trying to remember all the variations and permutations that scams, fraud and identity theft can take would be a difficult task. You have a greater chance of success avoiding them by just remembering some general rules, so we have included a section called Golden Rules. Following these simple 'Golden Rules' can save you a lot of money, pain, frustration, time and heartache, and will avoid most of the scams, fraud and identity theft you will be exposed to. Appendix 4: How Do You Remove a Computer Virus? It provides most of the information in concise bullet form along with photographs and images. It reveals smart and specific tips, techniques, and tactics that anyone can use to avoid being victimized—financially, physically, or emotionally. Identity theft is one of the most insidious crimes of today. It can hugely disrupt your life for years and even put you behind bars for crimes you didn't commit. It is important to understand how to avoid having your identity stolen, and if it is stolen, what you can do. Perhaps you have already been a victim of fraud, scams or identity theft, and are wanting to educate yourself so you don't become a victim again? This book will help protect you from future scams. If you are serious about not becoming a victim of scams, fraud and identity theft, then this is the book you need. However this book is not an encyclopedia. It doesn't provide information on every scam that currently exists. Evidence shows that these types of books rarely get read due to their size! It is a book that is intended to be referred to often, with the goal of educating and protecting its readers. This 113 page book is a concise, readable resource that is loaded with helpful information, proven strategies, golden rules, and tips that you won't find for sale anywhere else! Buy it NOW before you become a victim, and regret it! Immediately after your purchase, you can download your ebook and start learning new strategies, tips, and secrets the scammers don't want you to know. This eBook is in the Adobe PDF file format. If your computer doesn't have the Adobe Reader software, you can easily install it for free. P.S. This book shows you just how vulnerable you are, but it also shows you steps you can take to protect yourself from becoming a victim. If you don't learn how to recognize scams and how to avoid them, the statistics indicate you are very likely to become a victim in the future. P.P.S. 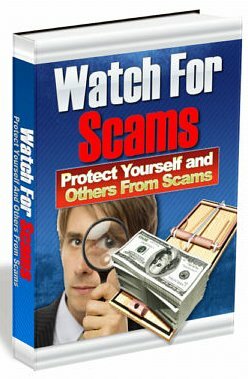 The proceeds from the sale of this book will be used to continue building and maintaining the Web site www.WatchForScams.com in an effort to educate and help people avoid becoming a victim of a scam, fraud or identity theft.